Anna Kramer in action Wednesday during her first-round match. 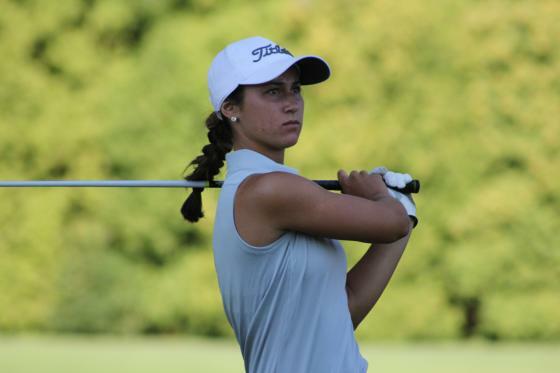 SPRING LAKE – Anna Kramer is the host-club kid this week, just 16 and part of the prestigious “Sweet 16” in the 99th Michigan Women’s Amateur Championship at Spring Lake Country Club. Kramer, who was part of a Division 3 state championship team for Spring Lake High School and second individually this past school year, beat Samantha Moss of Fenton 5 and 4 in a first-round match Wednesday. Up next in the round of 16 will be Samantha Kellstrom, another 16-year-old from Saline, who beat Princeton University golfer Tenley Shield of Grosse Pointe Park 3 and 2 in round one. Kramer and Kellstrom are two of four 16-year-olds in the “Sweet 16,” which has an age range of 16 to 21 and includes five 20-year-olds. All 16 golfers remaining are either college or high school golfers. The round of 16 and quarterfinal matches will be played Thursday starting at 8 a.m. with the semifinals and final match slated for Friday. The three qualifying medalists and thus top three seeds – Ohio University golfer Hailey Hrynewich of Muskegon, Michigan State University golfer Gabby Yurik of Oakland Township and home-schooled 16-year-old Allyson Geer of Brighton – each advanced to the round of 16. Several lower seeds managed to win in the first round, but the biggest surprise of the day was 2012 Michigan Women’s Amateur champion and University of Tennessee golfer Emmie Pietila being beaten by Western Michigan golfer Emma Salata 1-up. Hrynewich, Yurik, Geer, Kramer, Kellstrom and Salata are joined in the final 16 by University of Akron golfer Pader Her and Oakland University golfer Alyssa Albright, both of Lansing, Grand Valley State golfer Gabrielle Shipley of Hastings, recent Michigan Girls Junior Amateur Champion Sarah White of Caledonia, Northern Michigan University golfer Avery Rochester of Marquette, University of Tennessee golfer Hannah Pietila of Brighton, two-time high school state champion Cordelia Chan of Birmingham, Northern Illinois golfer Sydney Brickey of Burtchville, Bowling Green State University golfer Hannah Lewis of Plainwell and Nichole Cox, a Maple City Glen Lake High School golfer from Empire. Most of the eyes at Spring Lake this week have been on Kramer, whose parents are club members. Kramer said extra work on her putting this summer is paying off this week. Hrynewich, the 2013 runner-up, beat Michigan State golfer Priscilla Harding 3 and 2 and said she has improved her patience on the golf course. Yurik said she played some of her best golf of the week in dispatching Caitlin Starrs of West Bloomfield 6 and 5. Geer said she played solid for the most part in her 5 and 3 win over Morgan Smith of Muskegon.